This particular blog post started by accident. A few months ago, I bought the entire series of "Mama's Family" on DVD (I have a massive collection of classic television on DVD so I'm not dependent on cable). Previously, only Season 1 had been released by Warner Home Video back in 2006, and that only contained the episodes from the short initial season of the program based on the skits of "The Family" that were often seen on "The Carol Burnett Show". However, the spinoff "Mama's Family" series had an impressive six-season duration on television, although only the first two seasons were aired on network television, but the show was subsequently rebooted (and quite successfully) in syndication after that. Regardless, episodes after Season 1 weren't available until recently. However, StarVista/Time-Life finally acquired the original broadcast masters for the first two seasons (the NBC-aired ones, before the show went into first-run syndication) which featured Vicki Lawrence (Mama), Ken Berry (Vint), Dorothy Lyman (Naomi), Beverly Archer (Iola), and Allan Kayser (Bubba). It included the full episodes from every season, including the later seasons which ran in syndication as well as some extras including a reunion of the cast from the syndicated seasons, and interviews with some notable guest stars including Betty White (who played Ellen Harper). I should note that the first two seasons also featured Rue McClanahan as a cast regular (she played the uptight, spinster Aunt Fran), but both she and Betty White left the show at the end of 1983 to do a different show that went on to become a television smash hit The Golden Girls (catch my post on that at http://goo.gl/DD3pCP), so the end of Aunt Fran in Season 2 was definitely missing from DVD. Also, Vint Harper's 2 children Buzz and Sonia were also written off the show after NBC dropped it, replaced by Eunice and Ed Higgins' delinquent son Bubba. In any event, the DVD acquisition prompted me to visit Vicki Lawrence's personal website at http://www.vickilawrence.com/, where she shares some of her favorite recipes (see http://www.vickilawrence.com/Recipes2013.html). She wrote about a recipe called "Meal in a Meatball Soup" which was from the late Dinah Shore. She observed: "I have never cooked anything of Dinah Shore's that wasn't wonderful. She was a fabulous cook and a super nice lady. I miss her." That was interesting enough (the recipe wasn't half bad, either), but it got me to thinking that daytime talk shows with celebrities actually cooking as guest stars (Dinah Shore, Mike Douglas, Phil Donahue, etc.) during that era wasn't especially unusual. In fact, it was kind obligatory from a PR perspective back in those days. Remember, until the 1970's, most women in the U.S. were stay-at-home housewives who kind of really consumed celebrity recipes. Magazines and newspapers once routinely published celebrity recipes that doting housewives could make for their families, giving their ordinary meals some Hollywood magic. Frank DeCaro, the former movie critic for The Daily Show with Jon Stewart and current host of The Frank Decaro Show on Sirius XM satellite radio (just to name a few of his pop culture credentials) has released two cookbooks. In addition to his own TV appearances, he has appeared in a few movies himself, including in the Lucky Duck Productions "Inside TV Land: Tickled Pink" produced for cable network TV Land in 2005. But his most recent contribution to the American pop culture scene may well be his two fairly recent cookbooks. There's a website for his books at http://www.deadcelebritycookbook.com/. 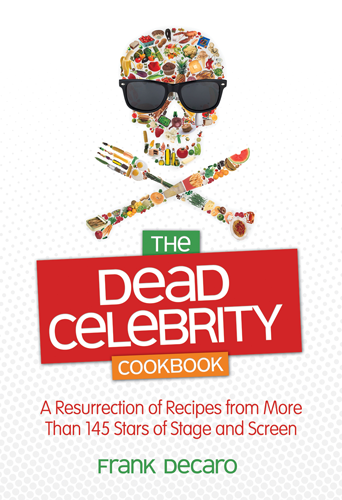 The title of Mr. DeCaro's original cookbook is "The Dead Celebrity Cookbook: A Resurrection of Recipes from More Than 145 Stars of Stage and Screen" (he followed that up with a sequel called "The Dead Celebrity Cookbook Presents Christmas in Tinseltown: Celebrity Recipes and Hollywood Memories from Six Feet Under the Mistletoe") which contains the favorite recipes of "living-impaired" Hollywood icons including Lucille Ball, Liz Taylor, Joan Crawford, Liberace, Michael Jackson, Frank Sinatra, Rock Hudson, Dean Martin, Alfred Hitchcock, and Humphrey Bogart among others. There's Patrick Swayze's Chicken Pot Pie, Elizabeth Taylor's Chicken With Avocado and Mushrooms, and Farrah Fawcett's Sausage and Peppers Supreme, but what really makes the book is the fact that its laced with Mr. DeCaro's pop culture insight and commentary. Mr. DeCaro says that all of the recipes in these two books were in the public domain (sourced from old newspapers and magazines, even in manuals for microwave ovens), he's just the one to assemble them, but what makes the books so great is he adds his own pop culture insight, organizing the recipes thematically and giving some clever names). He admits that not all of the recipes in his book were good, adding there were a few celebrity recipes he thought were just plain gross, hence he didn't even want to try making them for himself (which makes me wonder why he included them? ), and he also says he did not make or eat all of the recipes, but had definite opinions on the ones he did make. The recipes range from gourmet to garbage, if that tells you anything. As noted, not all dead celebrity's recipes are worth celebrating, and he admits to having sampled only about a third of the recipes, admitting that he really had no inclination to make some of the recipes, even noting that some of them were kind of vile. He was quoted as saying "I made a third of them before the book went to press. It's not 'Julie and Julia.'" "There's a recipe in the new book that's just downright creepy," Mr. DeCaro said, describing something like jelly consomme flakes in avocado. He made a retching noise over the phone as he described the recipe. Another recipe he wasn't fond of was Isabel Sanford's (she played Louise Jefferson on TV's "The Jeffersons") Boston Chicken. He says: "The recipe I always make fun of is Isabel Sanford's Boston Chicken. The recipe's sauce calls for Russian dressing, onion soup mix, pineapple and apricot jam." He has gone on record as saying "It was vile." He told another interviewer "We call it Chicken a la Barf." But he later added "I feel so bad, I've been slamming her all over the place. Isabel Sanford's Boston Chicken is pretty yucky. I'm not convinced it's a good idea to spread your chicken with a combination of apricot jam, Russian dressing and onion-soup mix." But he added that it didn't change his love for Isabel Sanford. Other recipes that weren't exactly culinary masterpieces included one called Lucille Ball's "Chinese-y thing." He said that just because you're a great entertainer, doesn't mean you're a great cook or culinary innovator. Indeed, I would dare say that some of the recipes were probably just public relations released by a publicity executive, although some celebrities actually did cook ... at least occasionally. The further you go back in time, the more likely that (cooking among celebrities) was, so some celebrities in the 1950s were often cooks at home - if we are to believe the PR created by publicity agents and studios! The recipes are cleverly organized into thematic chapters, including "Talk Chow" with dishes from now deceased talk show hosts, another called "I Lunch Lucy" with recipes by Lucille Ball and Vivian Vance, and he calls the last chapter in the non-holiday book "Thank You for Feeding a Friend" with dishes by the three deceased stars of "The Golden Girls": Bea Arthur, Estelle Getty, and Rue McClanahan (catch my previous post on that show at http://goo.gl/DD3pCP) to name a few, and Mr. DeCaro includes a short, summary of who the dead celebrity actually was, and some information about the careers that actually made them celebrities. "While [today's] celebrities now get their food fixes at trendy restaurants like L.A.'s Koi or Nobu, once upon a time they actually cooked. Eartha Kitt made a mean chicken wing, Gilda Radner whipped up a sumptuous apple cake, and Johnny Cash fried okra to perfection." Mr. DeCaro told Columbia University's The Protagonist newspaper (see http://nypress.com/the-protagonist-dead-celebrity-cookbook/) that the two dead celebrity cookbooks were more about promoting great performers than capitalizing on their deaths. The mission is to keep the celebrities' names out there and share pop culture history. But other recipes in the cookbooks were absolutely fabulous. 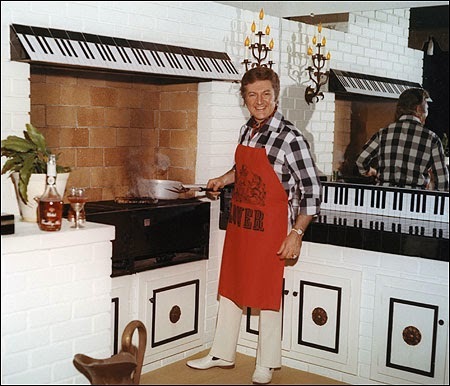 Among culinary successes was one from the late pianist Liberace, which he calls Liberace's Sticky Buns. "They start out with crescent rolls from the refrigerator case. They end up tasting so good that you never want to go in Cinnabon again. I made 24 and I ate nine before they were cool enough to handle" said Mr. DeCaro. (see the recipe below, or at http://www.epicurious.com/recipes/food/views/Liberaces-Sticky-Buns-368173). Readers of this blog may recall that I blogged about the 2013 Steven Soderbergh movie about Liberace called "Behind the Candelabra", see http://goo.gl/Wjek4g for the post. There were other good ones, too, ranging from Patrick Swayze's Chicken Pot Pie to Bea Arthur's Vegan Breakfast that not only tasted great, and were actually healthy, too. Preheat oven to 325 degrees. Spray two muffin pans with nonstick baking spray. Combine raisins and rum in a small bowl and warm in microwave on high for 45 seconds. Set aside. In a saucepan, melt butter and then stir in brown sugar and spices. Cook, stirring frequently, until it becomes a bubbling syrup. Put a teaspoon of syrup and a few whole pecans in each muffin cup. Unroll one package of crescent rolls on a piece of parchment paper. Pinch seams together to form one flat piece. Drizzle a quarter of the syrup over the dough. Sprinkle a third of the raisins and a third of the chopped pecans on it. Roll it jellyroll style. Cut into 1-inch-thick pieces. Place one slice of dough, cut side up, in each muffin tin. Repeat with each package of crescent rolls. Bake 13 to 15 minutes or until golden brown. Remove from oven and immediately flip the buns onto a cookie sheet covered with parchment paper. Replace any nuts that may have stuck to the pan and serve warm. Mr. DeCaro says that other recipes, such as Harriet Nelson's Chicken Casserole are also very easy to prepare. You take rice and mix it with three kinds of cream soups: cream of chicken, cream of celery and cream of mushroom. Then, you add cream and butter, because it's not rich enough with 3 creamy soups, and you add the chicken on top. He said "You don't need a defibrillator yet. It's very 1950s-tasting and very comforting." Regardless, this cookbook (indeed, both this one, as well as the holiday-themed one he released containing celebrity Christmas recipes) does accomplish what he set out to do. Whether its fine dining, or even healthy dining, is another matter. The real gem here is the accompanying commentary and the way he organizes the cookbook itself. That makes it entertaining reading even if you don't make the recipes themselves. To be sure, a number of the recipes are very much products of their era (after all, the celebs are now dead, so at least some of the recipes are more than a few years old), and for a variety of reasons, the recipes themselves haven't always stood the test of time, as Harriet Nelson's fat-laden Chicken Casserole best exemplifies (even if it tastes good). Culinary perfection was not the point of DeCaro's book, which features more than 145 recipes from as many deceased celebrities. 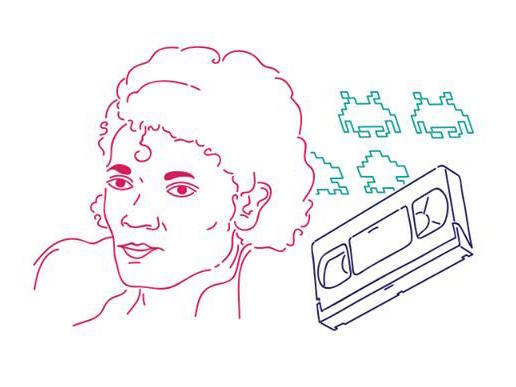 Helping a new generation of pop-culture fans rediscover them and their work was his goal. Each recipe is accompanied by a brief, cleverly written biography and a description of what distinguishes the particular featured dish. Perhaps for the next cookbook, Mr. DeCaro will consider having a celebrity chef like Rocco DiSpirito try to modernize them, or even follow the model that popular television show "Recipe Rehab" does so they're a bit healthier than the original magazine recipes so common in 1950s and '60s magazines aimed at homemakers of the day were? He told one reporter "One thing that's better about having recipes from dead people is, if you change them, they can't complain." Aside from Liberace's Sticky Buns, there were a few others worth trying. For example, a chapter called "Thank You For Feeding a Friend" is all about the Golden Girls being healthy (before taking dirt naps). PETA supporter Bea Arthur's Vegetarian Breakfast, Rue McClanahan's Non-Dairy Cheesecake, and Estelle Getty's Baked Chicken Fingers recipes are included. So far, Betty White, who is still with us and acting on "Hot In Cleveland", isn't included since she's still above ground. Bea's vegetarian breakfast is incredibly easy (if a bit bland), it was featured in People magazine at http://bit.ly/1i6xTtl. Recipes, of course, are a matter of taste. I rather liked Patrick Swayze’s Chicken Pot Pie and Eva Gabor's Hungarian Goulash was pretty darn good, too. Its hard to believe she once routinely made completely inedible food on the sixties TV show "Green Acres"!! These books were discussed on BlogTalkRadio and American Public Media (an NPR affiliated organization) "The Splendid Table" radio show, use these links to listen. The discussions, much like Mr. DeCaro himself, is pretty entertaining and worth listening to. The books themselves are available in hard-copy as well as Kindle editions, so you can download instantly.